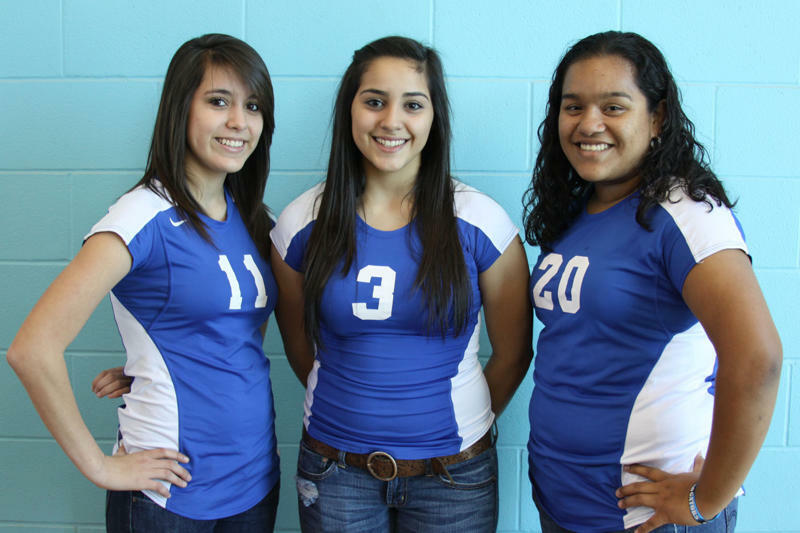 Grulla High School Volleyball players receive Honorable Mention in the 2010 Volleyball 32-3A District Selections while Bethany Martinez (#3) a junior is who is an outside hitter was selected for the second team. Martinez is a second year Letterman and has been a vital component on the team. Her District Stats are 8 blocks, 52 kills, 89 digs, 28 aces, 13 assists and 103 points. Her Overall Stats include 11 blocks, 73 kills, 119 digs, 38 aces, 24 assists and 142 points. She is a second year Letterman and has a promising senior year to look forward to. Marina Flores (#20) a sophomore is a middle blocker for her team. Her District Stats include 16 blocks, 37 kills, 22 digs, 5 aces, 3 assists and 47 points while her Overall Stats include 23 blocks, 52 kills, 34 digs, 7 aces, 8 assists and 76 points. Monica Escott (#11) a junior is a first year Letterman and is an outside hitter/right side. Her District Stats are 2 blocks, 27 kills, 157 digs, 16 aces, 5 assists and 124 points. Escott's Overall Stats include 9 blocks, 36 kills, 201 digs, 27 aces, 11 assists and 178 points. Congratulations to all these players for their outstanding achievements.